Facebook can isolate your spouse or partner based on your network of friends. In a fascinating paper to be published next year, Facebook social scientist Lars Backstrom and Cornell University professor Jon Kleinberg reveal just how much insight can be gleaned from the structure of a network, illustrating both the value of what the American security establishment reassures us is “just metadata” and revealing Facebook’s baroque privacy settings as the faith-based garments of the emperor’s new clothes. Here’s how it works: Backstrom and Kleinberg collected a random sample of some 1.3 million Facebook users who list a spouse or some sort of relationship partner on their profiles. That gave them a dataset with some 8.6 billion links containing 379 million nodes, or points where links overlap. 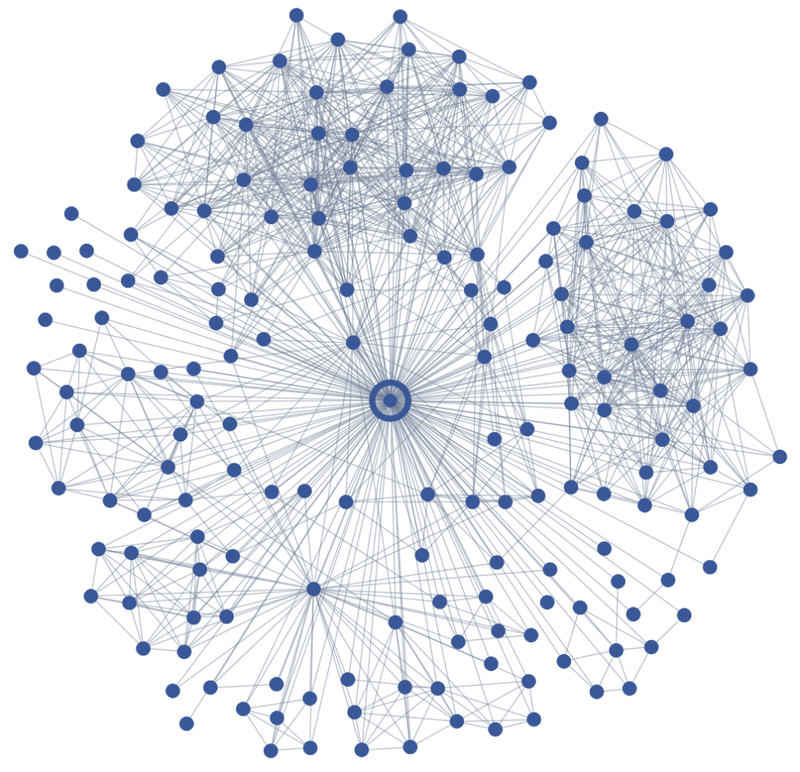 The long-standing mode of enquiry into a network’s structure is the notion of “embeddedness,” or measuring how tightly two people are connected by the number of friends they share in common. By that measure, your closest friend may turn out to be a college buddy. The authors used a new method to find more important connections. They propose the measure of “dispersion.” Instead of looking purely at the strength of connections, dispersion looks at how other points in a network overlap with discrete circles. In the illustration above, friends towards the top and top-right would be highly embedded. But the single node in the middle of the bottom-left of the diagram is more connected with a wider circle of friends. It is an elegant and remarkably intuitive idea: Your spouse may not be as thick with your work or school friends but she is likely to overlap with many more separate groups. Analyzing a network for dispersion produces results twice as precise as embeddedness in finding a given user’s romantic partner, the paper finds. The authors also find some truth in what might appear to be self-evident: A romantic relationship that shows high levels of dispersion is more likely to persist. In other words, people who introduce their partners to all manner of friends tend to stay together. Backstrom and Kleinberg looked at a subset of 400,000 users who say they are “in a relationship” and found that those who measured highly on levels of dispersion were significantly less likely to have changed their status to “single” 60 days later. Things become slightly more complicated when the authors do not already know whether a user is in a relationship. Still, analysis of a random sample of 129,000 users, nearly half of whom were single, accurately predicted whether someone was in a relationship 60% of the time. That rises to 68% when demographic factors are also considered. What does it mean for Facebook users? By figuring out who is most important to you, Facebook can produce a better, more relevant “news feed.” But it isn’t just Facebook that can use this information. Even if your privacy settings are ratcheted up to “opaque,” many apps that plug into your account have access to your friends list. Indeed, the same effects can be traced outside of Facebook, for example from your smartphone address book, to which most apps request access. As the authors write, “crucial aspects of our everyday lives may be encoded in the network structure among our friends, provided we look at this structure under the right lens.” In other words, simply belonging to a network reveals as much as what you tell it. “Romantic Partnerships and Dispersion of Social Ties: A Network Analysis of Relationship Status on Facebook” will be presented at the 17th conference on Computer Supported Cooperative Work and Social Computing in Baltimore, Feb 15-19, 2014. Via What your Facebook friends list reveals about your love life – Quartz.